Aglais urticae, more commonly known as the Small Tortoiseshell,is a small and attractive butterfly often seen in gardens, especially feeding on buddleia. Wingspan is about 50mm. The wings are orange with a thin border of brown with small blue dots along the sides. At the front edge of the upper wings there is a pattern of black and yellow or orange marks. 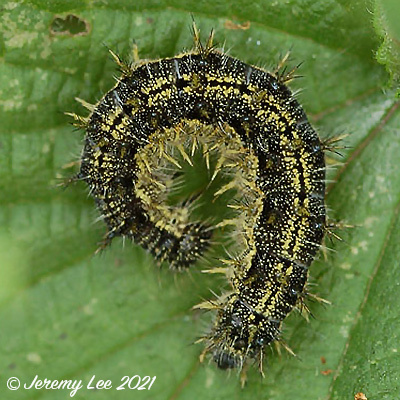 Eggs are usually laid on the common stinging nettle, and the caterpillars are yellow with dense black speckling and two yellow lines down their back and one along each side. They have black spines along their sides and back. They feed on nettle leaves, often spinning leaves together. The adults drink nectar from flowers such as thistles and buddleia. The adults will very often rest with their wings closed but will open and close them rapidly, flashing their bright colours to confuse and alarm predators. Small Tortoiseshells are not listed as endangered on the IUCN Red List 2000.